I decided with this kit I would use only the supplies provided. Even though there’s only one card idea supplied with the kit, there’s lots of ideas online from other truly creative and talented people. The card on the left is a replica of the card suggestion that came with the kit. 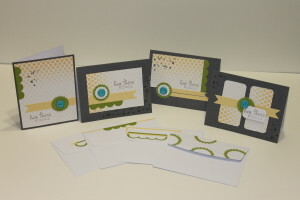 The second card from the left was inspired by Julie Davidson. The last two cards are my own originals. After the cards were done, I thought the envelopes looked a little plain and boring. It was easy enough to add a bit of color by cutting out the left over outlines of the stickers and adding them to the envelope flaps. If you have any questions about these cards or anything else, please get in touch. I’d be more then happy to help! !